According to the Mac Observer, 94% of Fortune 500 companies are either testing or using iPads. The widespread usage of these tablets from Apple has ushered in a new era in the world of online training. Millions of learners access online courses easily, anytime, anywhere, on iPads. These devices have indeed opened the door to highly effective and convenient learning. The iPad is the ideal tool to train your mobile workforce. It has a number of hardware and networking features which are very useful to impart high quality training online and create excellent learner experiences. 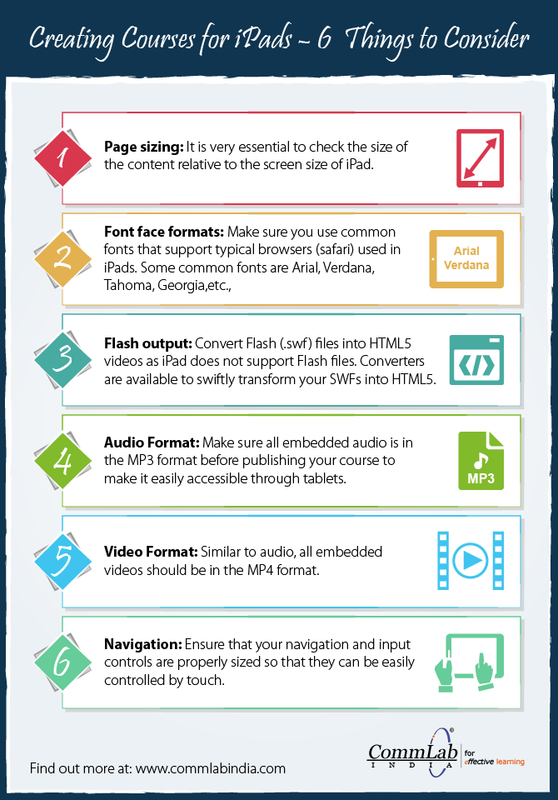 Here is an info-graphic that lists 6 aspects you need to consider when you develop e-learning courses for the iPad. Hope you find this post interesting. How do you use iPads? We’d love to know.